Dunlop's vast championship experience and development expertise has been infused into the next generation of off-road tires: the all-new Dunlop Geomax® AT81™. These new Geomax tires offer more all-around performance plus higher levels of ruggedness for off-road racing and riding. Formulated high-wear-resistant rear tire compound offers enhanced chipping, tearing and wear appearance. Dunlop's "plush pad" recess design between tread blocks enhances compliance for bump absorption and ride comfort. Amazing front tire with gobs of traction for off road use. Love this tire for the value and overall performance in varied terrain. This is my second rear tire in two years (75 hrs of moderate to aggressive riding in desert and single track). Dunlop AT81 tires are great for desert riding. Good grip and have held up really well. Have owned a few different models of the Geomax. Love them for riding in almost any surface from sand to rocks. Rocks are hard on them but don't expect them to last forever. I get a couple seasons of riding in before replacing. great intermediate tire for rocky missouri conditions. good grip, holds up as well as any tire in our sharp rocks. Tires… the most complicated item to buy as the variables are so wide with conditions, terrain, pressure, bike, etc. Riding in the Arizona High Desert with moist dirt, rocks, sand, dry hard kitty liter to rock faces, etc. we pretty much have it all out here. Usually ride every other day logging thousands of miles I have yet to find a tire. Every tire is the best tire you buy then it’s not, etc. The conditions change every day so and your tires wear and the you ride different trails its so hard to judge a tire. And there is no magic tire…you want sticky grip then you need a sticky tire. You want longevity then you need a harder tire and sacrifice in other areas. Dunlop AT81. I bought a new TE300 and the bike came with these. It rained here in AZ so the conditions were perfect. Moist dirt. These tires we sick as I was pulling wheelies out of every corner. Week later it dries up and the tire slides a bit but then again its kitty litter now out here and all the other brands slide also. Abused the tires on some jagged rocks and the usual punishment out here and they seem to be holding up fine. I do not see them wearing any more than the Kenda Parkers, Washougal’s, etc. They seem par. The tread pattern is definitely motocross based which is prime for moist dirt. Hard packed and sand you need a more directional type tire but then again these handled fine in washes. I always run 10 psi rear and 11 front and I am 6-7”+. I use 4mm tubes and never had a flat. Won’t go any lower psi wise. After running about 30 different tires types in the last 2 years (went on a tire finding hunt) these are definitely good tires. Time will tell on the longevity but to date they are holding up as well as all the other brands and models I have tried. I would have to rate these as some of the best all around tires for all conditions as they have in my opinion no set discipline. So if your looking decent priced tire for all conditions with good wear these are it. Very good all around tire that works in multiple types of terrain from sandy washes to rocky single tack. 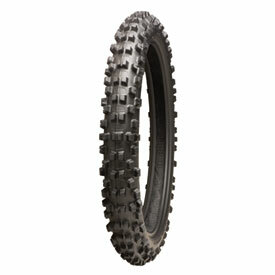 If you ride any sort of desert/hare scramble type of discipline, this is the tire to use. On my 7th straight one, unmatched traction in the sandy rock beds, hill climps, and all. Last one lasted me 25 hours on the dot, all racing. New versus 25 race hours. Still hooked up great! Love riding this tire. Great traction and wearing well. Pretty good tire when new but if you get a flat it pancakes flat to the dirt no side wall strength. This is a good all around tire. I use it in GNCC racing where there is different types of surfaces in one race. Tire wear is good. If you are using a nitro-bib mousse in the 110/100-18 tire, use the NM18-305 size. Dunlop runs a little bigger on the inside. 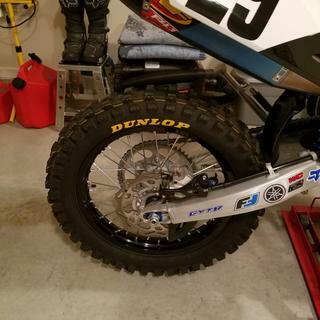 Dunlop A/T 81's came stock on my 2016 Husky TE 300. I have 65 hours on it now and replaced the rear tire. Front is still in great condition. I just ride in the woods in Oregon and these work fine for me and are easy to put on. I have STI heavy duty tubes in my tires and like those too. This AT 81 is the best front tire I've tried.It works anywhere, sand , mud, even hardback and stays predictable in Rocky terrain. 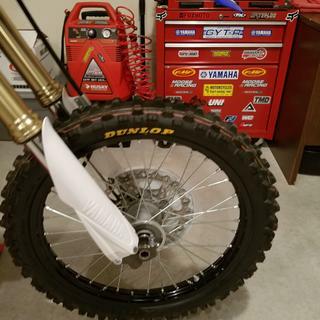 This is the only tire you need on any motocross track, has the latest technology by Dunlop and lasts a long time, use low air pressure on hardback 9 -10 psi. This is the only front tire I use, except for super deep mud. Very good tires!!! They grip great and they look very good! Really like the traction they create from Colorado's mountains to Missouri's loam and they last a long time without chunking whole knobs off , an vet B rider we ride hard pack blue groove to rock fields and mountain climbs would reorder these as best available. Biggest negative, they are not DOT approved. This tire hooks up better than expected on dry fire roads and at the prepped MX track. I have the matching rear on my YZ450F and they exceeded my expectations. love the geomax at81 great tire, they hook up great on 2008 ktm 200xc-w dunlop tires are the best. This tire performs great on the Alaska terrain I ride. It wears well too. I ride a KTM 300. Rocky eastern pa single track works great in the rocks and mud, wears long too. good when new but when castles wear and round a bit this tire has the worst dry conditions breaking ever. Can't recommend these unless you like blowing corners and hitting trees. I thought it might be the bad tire or something so tried another. Same deal, never again. Came with my bike stock. I ride single track trails for the most part and these hook up extremely well in all conditions. I'm on my 2nd set and I will continue to buy these from now on, that's how much I like them. Oh and buy a Moose Racing tire pen in yellow for the Dunlop and get them looking good! Perfect tire combo for southeastern hare scrambles. Have 3 races on a set and they have performed perfectly. Considering I ride twice a week in many varied desert conditions the tire perform well for all conditions. I especially like the stiffer sidewall when using a tubeliss wheel system. Works like it should. Miles better than the D606. Good tire but not my cup of tea. It wasn’t give me confidents in rocky terrain...great in sandy or dirt. Bought them on a recommendation from a friend. Only have one ride on them. Mostly sand. Really stick well, so far so good! Will update later if I don’t like the wear. Tire wears fairly well - but does lose its edge fairly quickly. Ride mostly rocky wooded single track and this tire does a pretty good job. Running 8 or less PSI works the best, and the tire has done well so far at lower air pressures. I bought this front tire and a Tubliss system for the front. Took it to the single tracks in WV with 7psi in the tire. The tire performed great from creek riding to loose ground to harder packed ground. Used it for LAB2V. It was dry and dusty but it still performed well. In tacky conditions this tire is awesome! Second Dunlop AT81r I've had. West Texas enduro area this tire is great. Use UHD tube and run 7-9 lbs for awesome traction. Heavy carcass with UHD tube seldom mesquite flats. I love this tire, both front and rear. 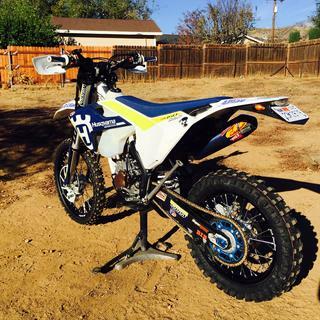 I have tried 5 other tires on my YZ and I wrnt back to these. Great in most of the terrains I ride. Good wear too. I put a set of these on my 250f trail bike. The front was very disappointing. The rubber began to fail after about 10 hours/ The side knobs did not chunk but instead ripped away and peeled the sidewall of the tire away after hard cornering rendering the front useless for hard cornering. Although I thought the front wore fairly well compared to the MX series of dunlop tires. The rear never did provide the best grip compared to other dunlops and the Kenda tires that I run (Millville and Washougal). I feel as though it wore down too quickly for just trail riding. It was not good in slick stuff at all after the first 10 hours. I also chunked several of the knobs too soon. I would not recommend for a serious rider or racer, but for the causal rider this would be a good set of tires. 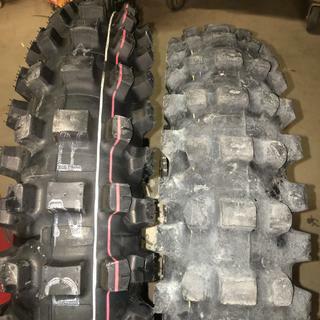 This tires works well in most conditions, I ride sand and rocks and although there are better options for such vastly different terrain the AT81 is a good all around compromise. Life has been better than other tires I have used, on my 300 2T I normally run them about 50 hours. Dunlop Geomax at81 tire has my heart, great tire, longevity, hooks up great, and holds up great even when you have a flat. i will not buy any other tire. I am thinking of geomax 81at. Or what you think I need (tire). Az rider hard granite, like ice. 100 versus 90 is the height of the tire. I would go with 100 for the type of riding you are doing. I also ride alot of granite here in Co and I use the 110/100. Get some new meat and rip! Good tire. Can’t say for the Arizona riding. Nor cal! Cal your local shop and pick their brain. Offer them the online price. Front tire. 90/90-21 vs 80/100-21 Both fit. Which should I get? Single Track North CA rider. I think the 90/90 would be good for really flat hard packed though! I'd go with the 90/90-21, with the logic being you get a slightly wider footprint. I ride 2013 KTM 450 XC-W and have tried many tires and combinations. 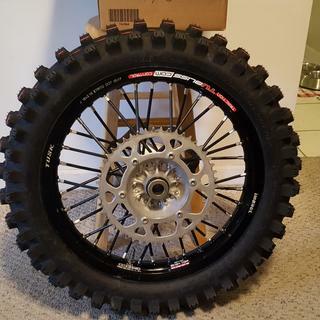 My favorite combo for all around off road riding in So Cal is the MX52A front in 90/90-21 and AT81 rear in 110/100-18 with Bridgestone UH tubes. The 52 front wears well and offers consistent traction throughout its service life. 80/100-21 works really well for me, it hooks up great. 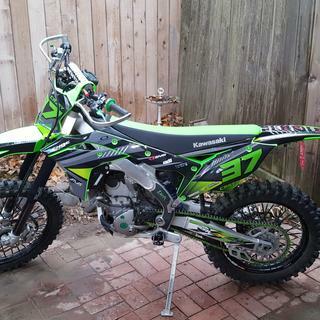 I have a 16 KTM 450 xcf. I race cross country, ride trails and hit moto tracks. It works well all the way around. I highly recommend a mousse bib, it gives a whole new element of traction. 80/100-21 will suit your needs well. If you are riding in rocky terrain I would go with the 90/90. It is a taller tire and will give you a better ride and additional rim protection. If you ride a lot of rutted trails, the skinnier tire works better.